I’m feeling a little defeated right now. One of the Etsy teams I am on did a (voluntary) critique and I signed up for it. Problem is, when I signed up I figured I’d have all this time to make and add things to my shop. However, I didn’t. I also didn’t work on a new avatar or a new shop banner. The avatar is a picture of a center piece that I made for my sister’s bridal shower and the banner is a picture that my niece made on some program on her iPod (which is supposed to be me). Well, I got ripped for having those two in my shop. Almost everyone hated them. Yes, I know I needed to change it. And yes, I thought I would have had something to replace this images by now. But, I didn’t and now I am feeling overwhelmed. Also, even when you know something is wrong, sometimes it hurts to see it. I wanted to defend all comments, but deep down I know they were all right and just trying to help me. I need to remember that! It wasn’t all bad. My work itself got great compliments, as did my shop policies and the fact I offer free shipping. It made me feel good that people said that they liked my work. But why is it that you can get a million great compliments, and only focus on the negative? Or is it just me? I know I asked for it and it really is helpful. It’s all things I need to hear and it will help me in the long run. So for now, I will make a list of all of the comments and suggestions and work on one at a time. If I break it down, maybe that will help me from being so overwhelmed. It’s always good to have others look at your shop and give honest feedback, whether it hurts to hear it or not. These other people sell on Etsy and have an idea of what customers are looking for when they shop. They also don’t know me so they can be honest without doing that polite “it looks great!” feedback you often get from friends and family. (Unless you have a sister like mine – she’s brutally honest with me – more so than most of these other shop howlers probably were. Haha). I feel a little better now that I have a plan. Not so overwhelmed! Posted in Uncategorized and tagged avatar, banner, card making, Critique, Etsy, Etsy shop, feedback. Bookmark the permalink. In August 2010, two of my friends and I went to Temptations in Cancun. Yesterday, I got home from a 4 day trip to Secrets in Jamaica. These two trips are vastly different and not just because of the locations. They were both all inclusive, but totally different. We were so much more prepared for this trip, even though we booked it with less lead time than the Cancun trip. So, what was the difference? First, we did more research. For Cancun, we found a deal and just went with it. Unfortunately, once we read the reviews and got to the resort, we realized why it was so cheap! One room’s phone didn’t work and didn’t have a hair dryer (which when we called, they didn’t bring), the other room’s toilet wouldn’t stop running and we had maintenance there at least once a day. When I went back to the room one day, the maid had opened the door to clean the room, but wasn’t in it. She left our room (and all our belongings!) exposed to anyone who walked by! When I called to complain, they didn’t care or even seem to think that was a problem. Oh – and it also used to be a swingers resort. Did I forget to mention that?? We found that out in reading the reviews – after we booked! Moral of the story – read the reviews! Speaking of restaurants, when you are at an all-inclusive, make sure you check to see if you need to make reservations. At Temptations, you could make reservations a couple of days ahead of time. If you didn’t know that, then you had to go down to a building and wait in a line to see if there were any reservations left at the restaurant you wanted. If there weren’t, then you had to eat at the buffet. Considering that we were so ill prepared, I am sure you can guess where we ended up eating most nights! One night we were able to eat at one of the nicer restaurants. Very disappointing. However, at Secrets. there were no reservations required. We could go to dinner whenever and wherever we wanted, with the exception of the hibachi. There were many options and we never had to wait in line, with the exception of once at breakfast. The wait was only ten minutes, so even that wasn’t terrible. The next tip is about alcoholic beverages. While we learned a lot of “what not to dos” from the Temptations trip, we also learned some “to dos”. We got there and were drinking out of the little blue glasses. 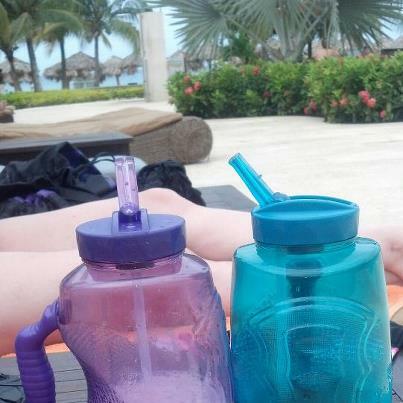 Then we looked around at the pool and saw a bunch of people drinking from water bottles. How smart is that?? Less refills – more pool time. (Even though we were at a pool with a swim up bar!) We bought (expensive) water bottles from the gift shop. For this trip, we were more prepared – we brought 64 oz water bottles. The staff came around and refilled our cups with ice to keep them cold and only had to fill them twice a day! We tried different drinks and found the ones that we liked the best and filled our bottles with that! My next tip is a money saver and a time saver! For this trip, we packed everything into two carry ons each. So, we didn’t have to pay to check bags and then we also didn’t have to wait for our luggage. We went through customs fairly quickly and were able to get to the hotel faster! Only pack what you need – and what fits into your carry on. The last tip is to try booking a time share. That was also the difference between this trip and last. We used my friend’s time share. But, when people aren’t using theirs, they post them for sale on websites, like http://www.redweek.com or http://www.sellmytimesharenow.com. You can find some great deals on there, even last minute! Each and every trip we learn a little more. I am becoming so much better at packing – I was able to bring everything in an overnight Vera Bradley bag and a Vera Wang Princess bag (that doubled as a beach bag) that wasn’t much bigger than most purses! Hopefully this gave you some tips for your next trip. Thanks for stopping by! Feel free to leave a comment and become a subscriber! Posted in Uncategorized and tagged all inclusive, carry ons, flying tips, island vacation, packing for a trip, packing tips, researching vacations, resort, restaurants on vacation, time share, vacation, Vera Bradley overnight bag, Vera Wang bag, water bottles. Bookmark the permalink. Yesterday I attended a Marketing Mixer with some team members from one of the Etsy groups I belong to, South Jersey Etsians. It was really fun to hang out with creative people who experience some of the same challenges I am facing while trying to promote my Etsy shop. One of the topics of discussion was social media and ways to promote our businesses. There are so many different forms – blogs, YouTube, Facebook, Twitter, Pinterest, Wanelo, etc. How do you choose what to use? Can you do them all? If you do, how do you divide your time amongst all of the options? At what point does it become overkill? Or can it ever become overkill? We all sell on Etsy, so we already had that social media outlet down. There’s always something to learn and I did learn some things. Such as, there is an app to help create treasuries. There’s also an “offline media” section where you can grab a code to link your shop on your blog. I need to take advantage of these tips. The second social media outlet that most of us have is Facebook. It can be a powerful site to upload pictures of your work, promote your new blog posts or YouTube video or let your followers know what craft show you are going to be attending in the upcoming weeks. Twitter can also have the same effect. I use both – Facebook more so for pictures and longer updates and Twitter to send links to my YouTube videos or new blog posts. One of the things that was brought up was, how much is too much? If you are on ten different social media sites, how do you have the time to update them all? I do realize that I am on lots of different social sites, but I use them sporadically. I find that whatever I joined last is what I spend most of my time on. Lately, it’s been working on YouTube videos. But I still try to update my blog (this is one of my goals for 2013 – updating it at least once a week! ), tweet and Facebook. However, most of my tweets and Facebook posts are promoting my videos or sending out a link to my blog. i am not taking full advantage of all of the aspects of this blog. A fellow teammate, Erin, recommended an ebook Launching a WordPress.com Blog for Dummies in a Day. (Her blog is serendipityblu.wordpress.com if you want to check it out). I plan on reading that and hopefully I can maximize the effect of my blog! I know that there are many things that I still need to work on when it comes to social media. If anyone has any tips or tricks for any of these sites, please feel free to share. I’m looking forward to reading up on these sites and hopefully learning a lot. I will share what I find and I hope you will too! Posted in Uncategorized and tagged Blogs, Etsy, facebook, Pinterest, social media, south jersey etsians, twitter, using social media for promoting small businesses, wanelo, YouTube. Bookmark the permalink. Have you ever been working on a project and you need to write a title or label something and you just can’t find the right color letters? You have the correct size and style, but the colors just don’t mix with the layout. That happened to me yesterday. I didn’t want to use the Cricut for a two word title, so what were my options? I found a set of letters that i picked up in the dollar bin at AC Moore a long time ago. 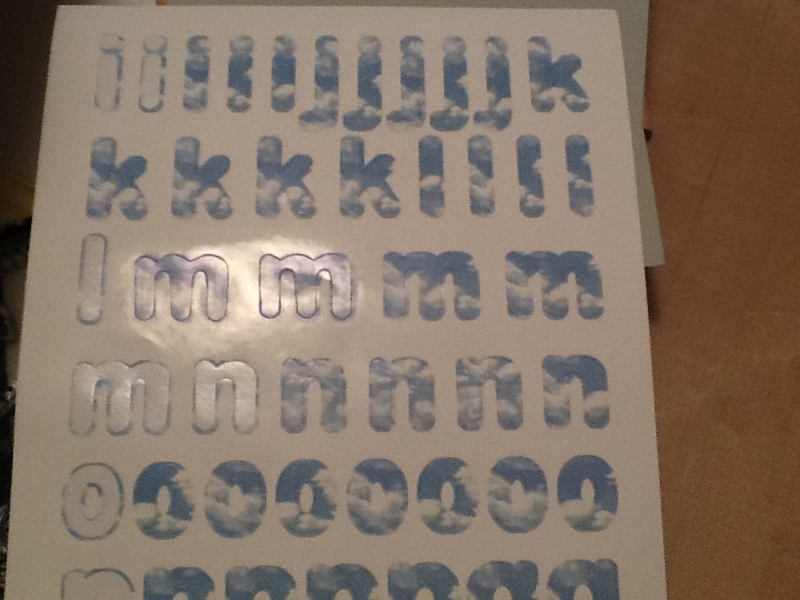 The previous page had the colors white, black, yellow and grey and these letters were blue with white clouds. While they were really cute, they didn’t exactly match with the previous page. I tried to use them, but it just didn’t look right. What was I going to do? To add some interest to the page, I used a silvery glitter ribbon to the black background. 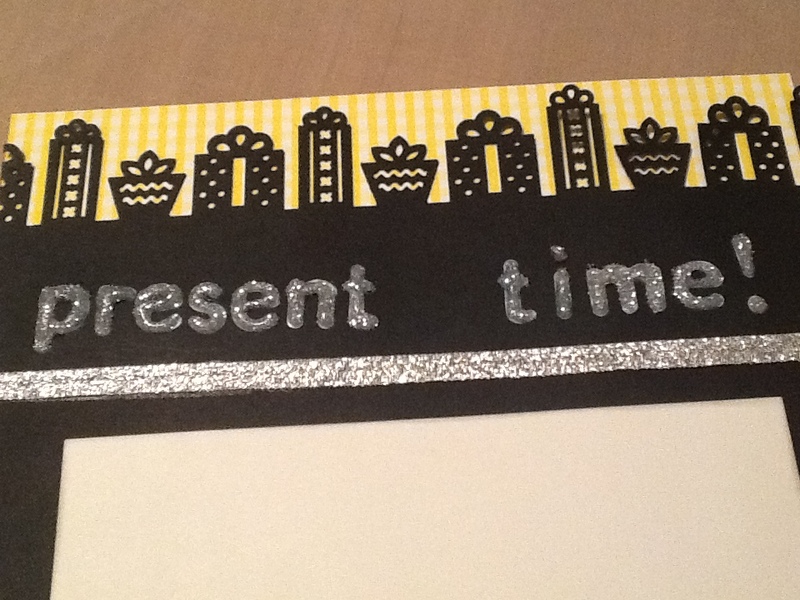 I had used a Martha Stewart punch to create a gift border and then I added the ribbon to tie it into the opposite page. But, then looking at the page again, the letters looked really out of place. I wanted them to tie into the silver/grey. What could I do? Glitter glue! I have a couple of bottles of silver glitter glue and I thought that adding it to the top would make the letters look more like Thickers and would match. So, I carefully traced all the letters with the glitter glue. It gave the page some dimension and it also made sure that the title was nice and straight, as opposed to me free-handing it. Just because something isn’t the exact color you need doesn’t mean you should discount it as something that you can use on your page. There are plenty of ways to alter embellishments so that they will fit your theme or color scheme. I could have used regular paint to create the appropriate color. You can use ink to change the color of embellishments as well. To use an embellishment that is the right shape or size but has a sentiment that doesn’t match, use a piece of white card stock and stamp to create a new greeting. With just a little bit of creativity, you can use those things that have been sitting in your stash because they don’t exactly match with what you are working on. I hope this inspires you to look at your supplies a little differently. Thanks for stopping by! Feel free to leave a comment. Posted in Uncategorized and tagged baby shower page, creating a title, glitter glue, letter stickers, Martha Stewart gift punch, scrapbook page, silver ribbon, using supplies in a creative way, yellow black and grey layout. Bookmark the permalink. Recently, I ordered these two Cricut cartridges. Walmart had a deal 2 for $50. It looks as though Walmart is really the only one who carries the Teddy Bear Parade cartridge, so I thought that I would go ahead and order it. I have been wanting it for awhile. Especially after I saw diamondrose123’s video on how you can use that cartridge with other ones that feature animals, like Create a Critter. I’ve seen many cute projects from the Love you a Latte cartridge as well. I was so excited to use these cartridges. Until the post office got involved. I ordered them on Jan 1st and they got shipped by UPS to my post office by the 4th. They didn’t deliver them to me until the 8th. Not sure why they kept them so long. 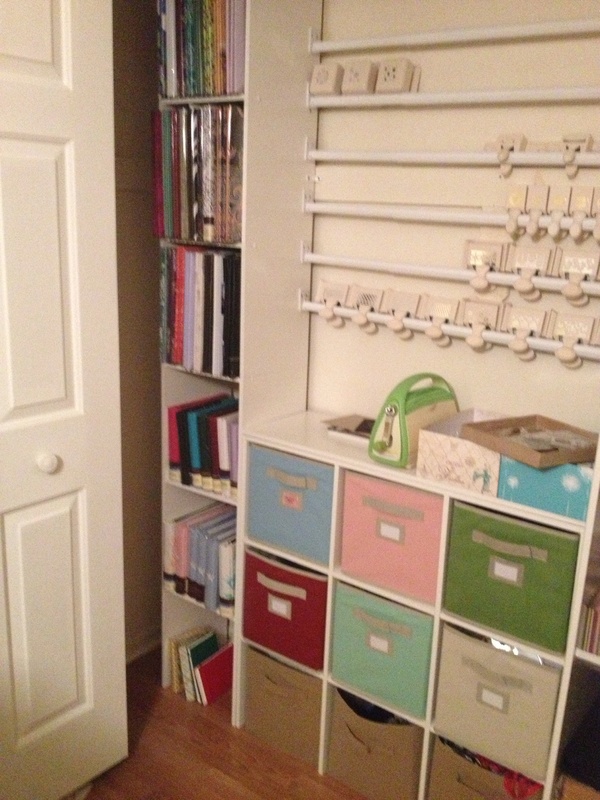 But, by the time I got them, I was in full remodel mode of my craft room. So, unfortunately I haven’t had time to use either of them. But, even though I haven’t used them, I have several ideas for some projects. So I will be making a lot soon – hopefully this weekend. Look for some pictures to come soon! Since I haven’t been able to craft, I’ve been busy redoing my room. I got a couple of closet organizers from Home Depot and some baskets. It’s coming together nicely. i have several shelves of scrapbooks, places for my stamps and punches and even little cubby holes and holders for some of my smaller supplies. Posted in Cricut, Cuttlebug, Embossing Folders, ideas, Storage, YouTube and tagged craft room, Cricut, love you a latte, Organization, punches, scrapbooks, teddy bear parade, Walmart. Bookmark the permalink. So, it’s only the second week of the year and already I’m thinking about Valentine’s Day. Actually, I started working on them at the end of last year. It seems as though, like in the food industry, you are always worried about the next holiday before the current one is even over. Or maybe that’s just the crazy world we are living in. Retail stores seemed to have adopted that philosophy as well, so I guess my business has to follow suit. When I started out creating some design concepts, I wanted to do a lot with distress inks. I have a lot of pinks and Valentine’s Day seemed to be the perfect time to try out mixing and matching for some unique backgrounds. The first card I started out making was one I designed around a stamp set that I have had for awhile, but have never used. It contains a stamp that features two birds holding hearts. One says “Be Mine” and the second one says “Or Else”. 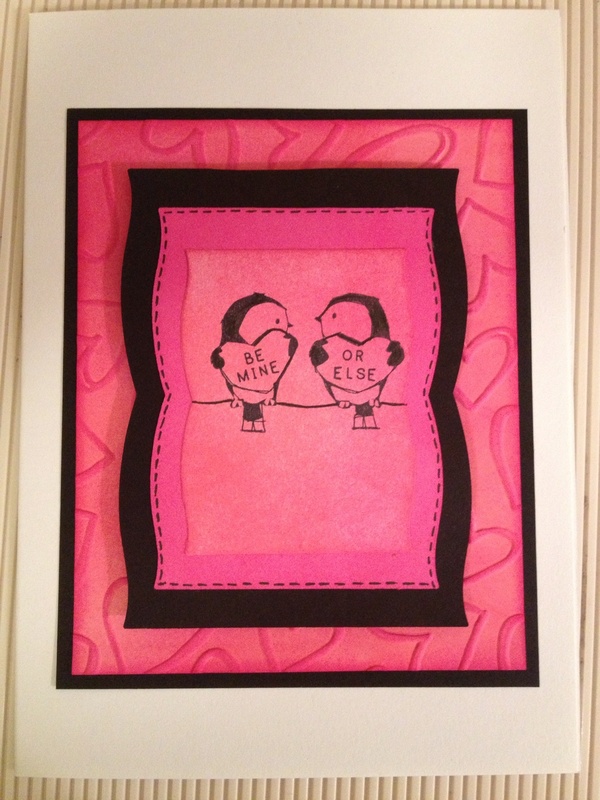 I used two Spellbinders Nestabilities dies and used white cardstock to create the top two layers for the card. I used Worn Lipstick distress ink to color the top layer (which is the layer the stamp is on) and then used Picked Raspberry for the next larger layer. I backed both of them with a black cardstock. The next thing I did was create the background. I took another white piece of cardstock and used the same technique with the Worn Lipstick distress ink. I then put the newly distressed cardstock in the hearts embossing folder and then used the Picked Raspberry on the embossed image. This technique highlights the embossed image while the debossed part retains the original distress color. The background was backed with some more black cardstock. I placed pop dots on the back of the original image and then assembled the card. Thanks for stopping by. Please feel free to leave a comment or become a subscriber. You can see some if my distress techniques at my YouTube channel – chelebelle1120. Posted in card making, Cuttlebug, distress ink, Embossing Folders, ideas, stamps, Stamps for crafting, YouTube and tagged be mine or else, birds stamp, black cardstock, black gel pen, distress ink, heart embossing folder, picked raspberry distress ink, Valentine's Day, white cardstock, worn lipstick distress ink. Bookmark the permalink.